You know when you enter a competition on Instagram and never expect to win? I entered to win two tickets to DogFest (which we were heading to anyway) and we only went and bloody won!! 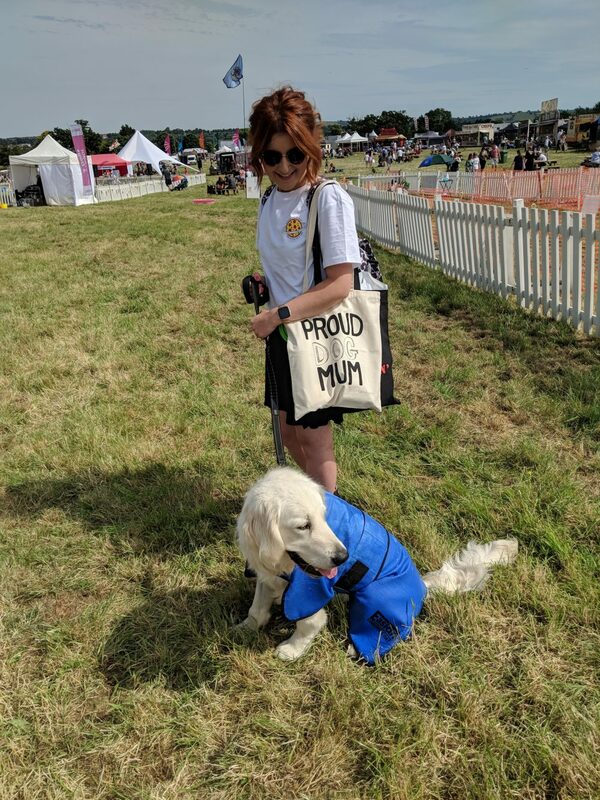 We went to DogFest West in Bristol on 23rd June and all had SUCH a good day. 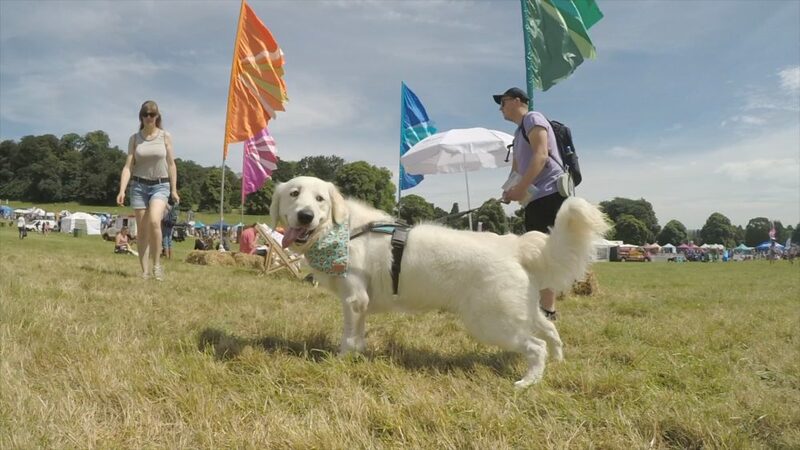 Its hosted by Professor Noel Fitzpatrick, The Supervet and it is a perfect family day out for you and your dog/s or even if you just love dogs. 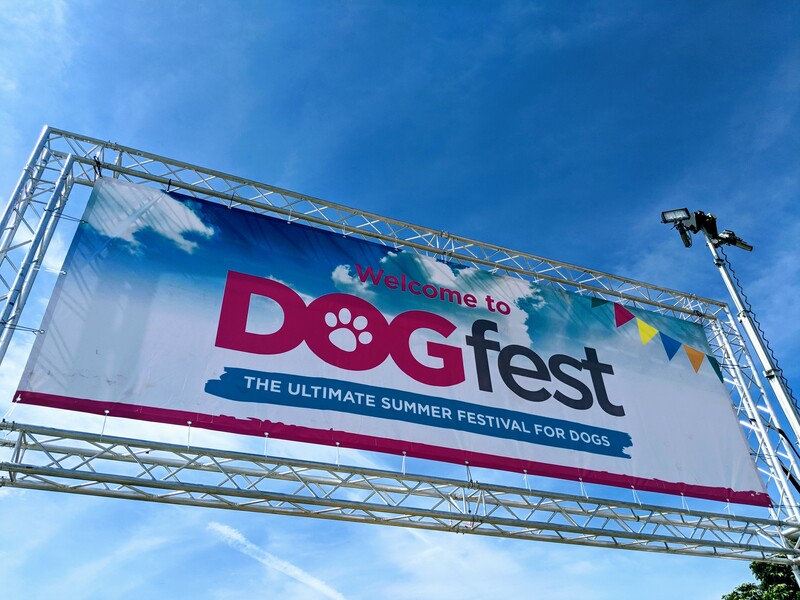 It’s packed with demos, have-a-go activities for dogs, shopping, music, food and drink and expert advice. We arrived at Ashton Court Estate at around 11:00am because there were huge queues to get into the festival. It took over two hours to get to Bristol from our house and as you can probably imagine, Woody was an absolute dream on the journey down! It was a super hot day which is a rare thing to find here in the UK so we made sure we packed plenty of water. 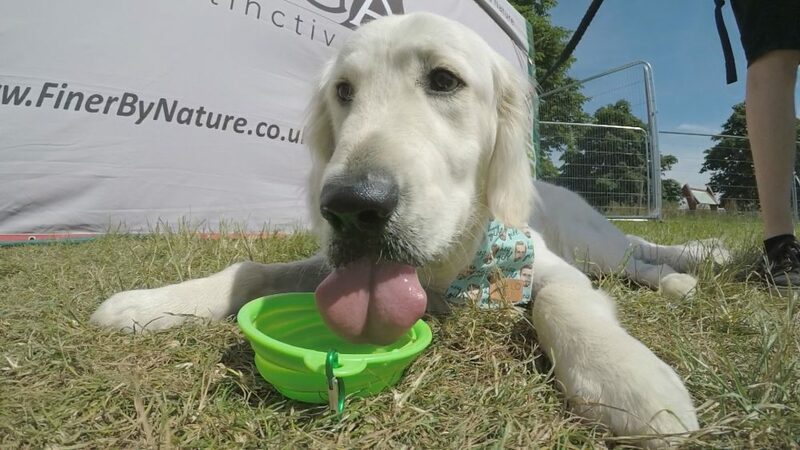 There was also loads of water stations around, dog water bowls and paddling pools for the doggos to enjoy which were regularly filled up throughout the day! All of the stalls were in a large circle which made it easy to browse through and buy loads of things. Be warned, if you are planning on going next year (which you should) make sure you have a healthy bank balance when you get there because there is SO much cool stuff to buy! 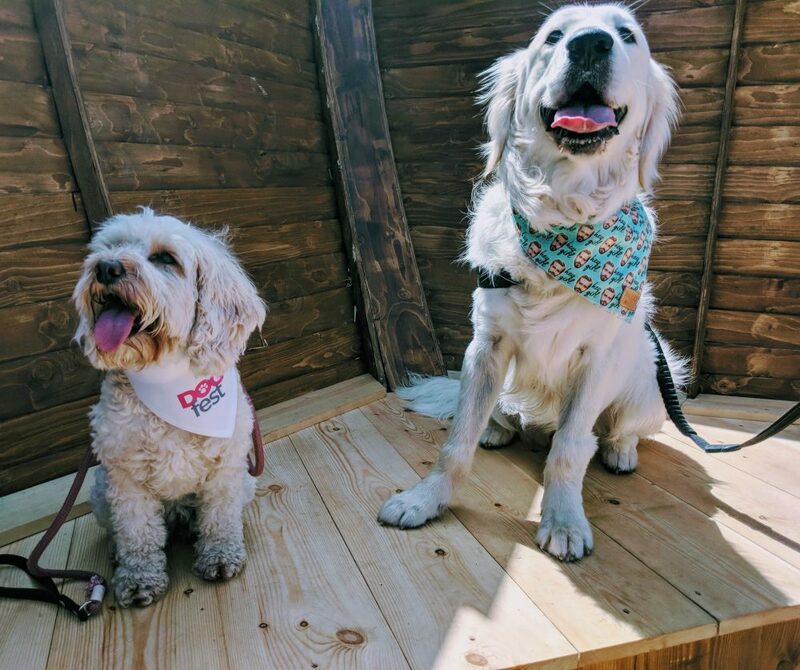 We headed to the hound hangout when we arrived at DogFest to meet Piper and her hooman and of course to say thank you for the tickets. It was so lovely to meet our Instagram friends! After we met Piper, we went to find shade because it was roasting. Alex stayed with Woody while I went to refill the water and had mooch at the stalls. I came across Dorwest who are the leading authority on veterinary herbal medicine and supplements for dogs and cats. Since finding out about Woody’s elbows, herbal remedies have been something that have interested me, except everything I have looked into are for ‘dogs’ and ‘not suitable for puppies’. I got speaking to the guys at the Dorwest stand and amazingly they have products (apart from a few) which are suitable from weaning. I left their stall with a sample pack of lots herbal remedies which came in a lovely limited edition keepsake tin. I was also drawn into Tabby Rabbit’s stall. She’s a super duper illustrator who loves dogs. Unfortunately she wasn’t at the stall when I visited but I left with THE best tote bag – modeled below by yours truly. Thank you Tabitha, you’re very talented! As the day was going on, the temperatures were rising. We started seeing more and more people wearing blue coats. I stop a lady with three retrievers and asked what they were all about. They were EasiDri cooling coats. The lady raved about how good they were and that she ‘never leaves the house without them’. We headed to the EasiDri stand and I think it’s safe to say that they made a killing that weekend! We bought Woody a large, although a little big at the moment we know he will grow into it. 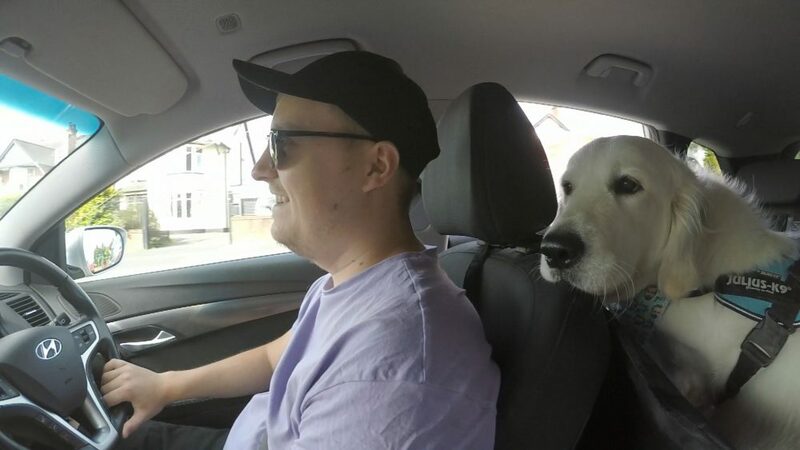 We are really impressed with it and it helped Woody loads on that day – it’s a 10/10 from us! 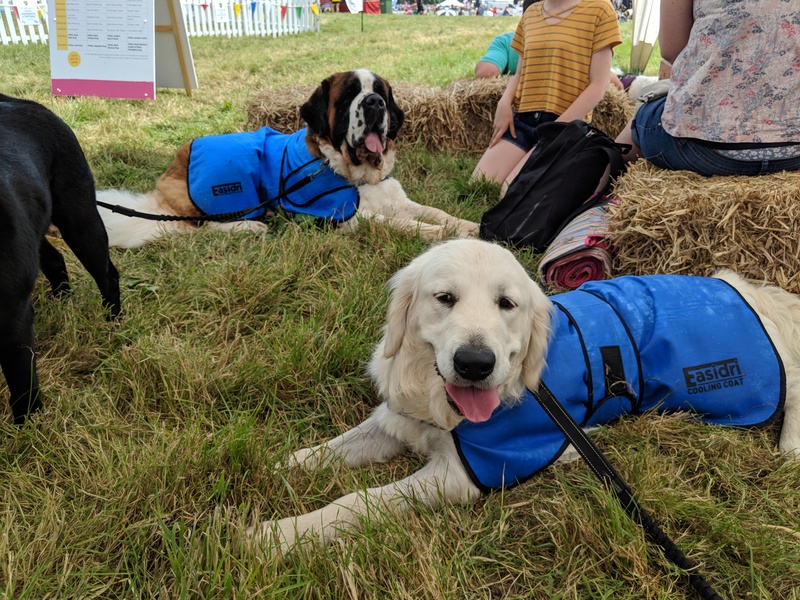 There were plenty of activities/shows for the dogs to take part in but it was a little too hot for Woody to join in. We had fun watching from the sidelines and saw some really cool dog tricks at the school for dogs! Our day ended by meeting a lovely little retriever who I could have happily taken home with me – he sat on my lap and the rest was history! 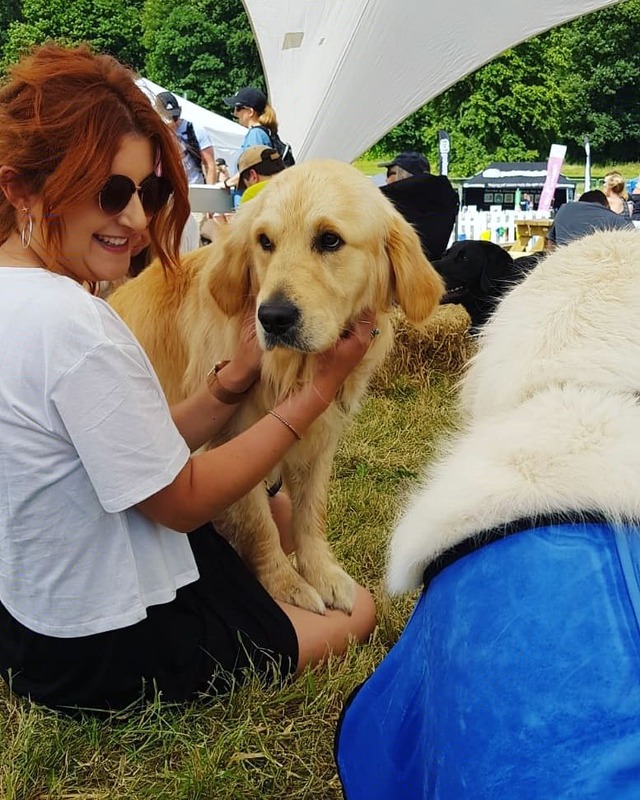 We got chatting to his owner who told us about a Golden Retriever gathering which is happening in August not far from us which we will be attending for sure! We are going to be in Goldie heaven and I cannot wait!! It was our first time to DogFest but most certainly won’t be our last!